Yesterday I went back to St. Paul and claimed my high school yearbook. To say that it was nostalgic would be an understatement. As I stepped on the grounds of what used to be my home, everything just came rushing back in. The Paulinians were having their Intrams practices for next week yesterday, so the place was filled with people, drum beats, and human pyramids. So many things have changed, and yet I felt like nothing has. 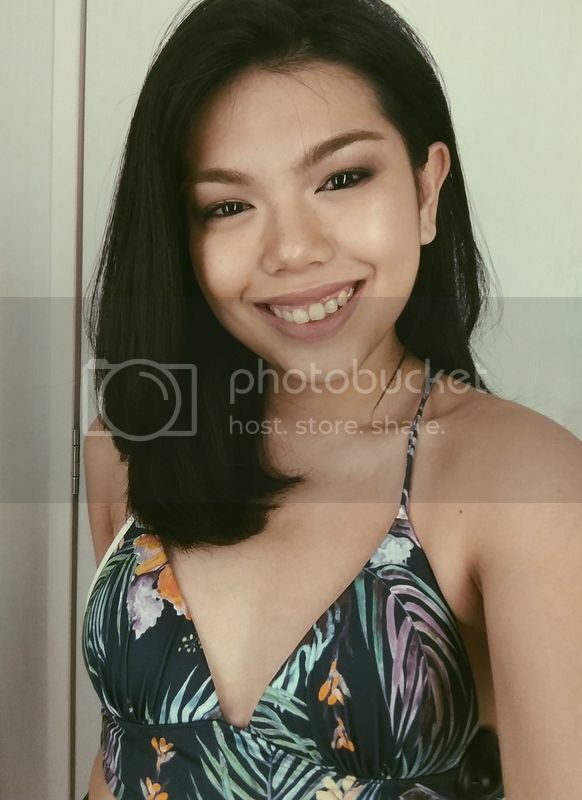 Suddenly, I could imagine Trixie calling me to announce something over the PA, or Hope shouting my name in excitement, or Nica tugging my skirt back to the room -- it was high school all over again. I felt naked walking through the campus with my civilian clothes on. It's been almost two years. 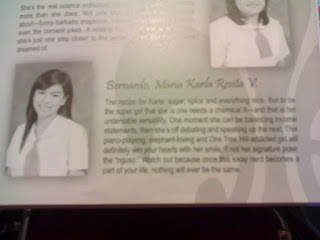 One touching moment was bumping into batchmates upon arriving at the Business Office to claim my yearbook. We weren't close, and we weren't classmates, but somehow, we stood there together along the counter, carefully flipping through the pages and all together saying, "Awwwww. Nakaka-miss." It was moving how reminiscing brought us somewhat together in those first few moments of glancing at the book. It sounds cheesy looking back on it now -- but God, the goosebumps were undeniable. It was like opening a window to the past. It was a bittersweet experience, drowning myself in wistfulness. I really, really miss the Seni08rs. I was laughing as I read the descriptions I wrote for my friends and for our class (St. Jane), well mostly because of the typos, but also because I could remember writing them on a 1/2 crosswise before recess and asking for Cream-Os as payment. And it surprised me how spot-on the words still are even if it's been more than a year later. I also suddenly remembered the night I wrote the Letter from the Editors, how it somehow felt obligatory, but oh how it rang so true now. 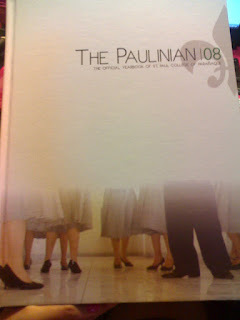 My St. Paul days may be long gone, but the Paulinian spirit lives on. Blowing and bursting, coming and going.